Are you a big Harry Potter fan? We are too! 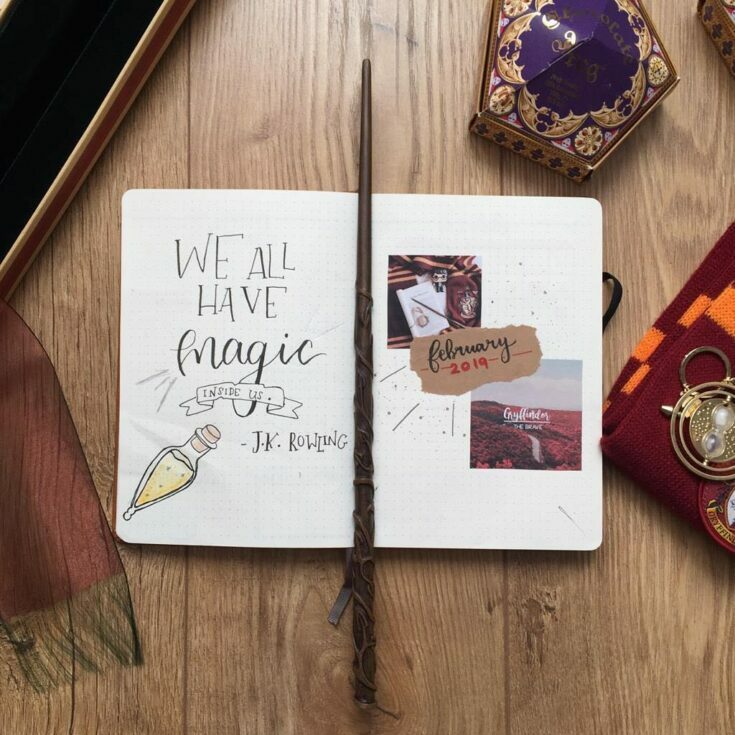 We have a list with some amazing Harry Potter Bullet Journal Ideas and Inspiration for your bujo! 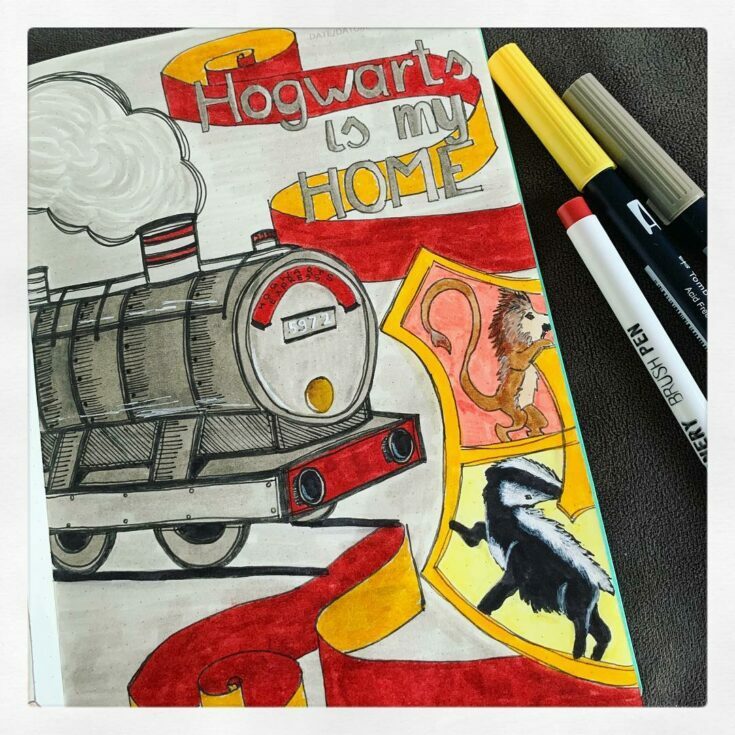 Harry Potter fans all over the world show off their beautiful book and film inspired artworks. In the bujo community it is no different! If you like to keep stuff artistic in your notebook and choose a bullet journal theme to go with for each month then you will really enjoy this list below. I have featured here some beautiful art which you can get some inspiration from! We have here trackers, monthly cover and weekly bullet journal spreads all inspired from the books’ characters, Hogwarts and school houses. You will sure be amazed by the artistic talent and creativity of some of these artists! Please click to read more to land in the exact instagram picture and follow your favorite accounts! 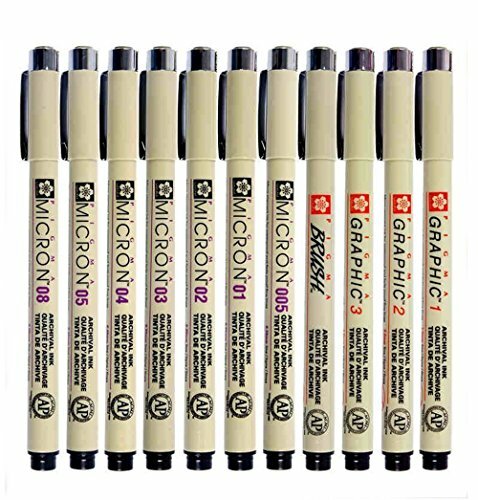 Water-proof, non-bleeding drawing fineliners that are an absolutely must to get your spreads looking amazing! 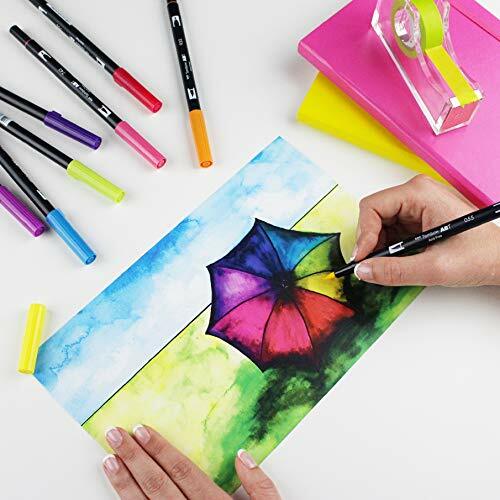 These markers are amazing and perfect to be used in your journal. 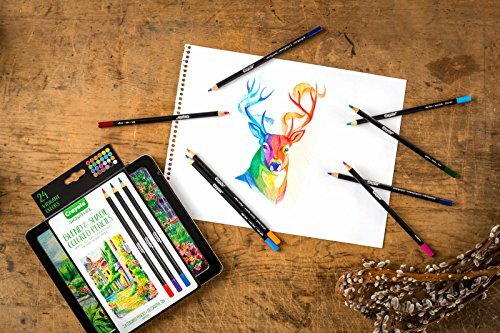 Easy to blend and smooth color laydown makes this a perfect colored pencil set to bullet journal pages. 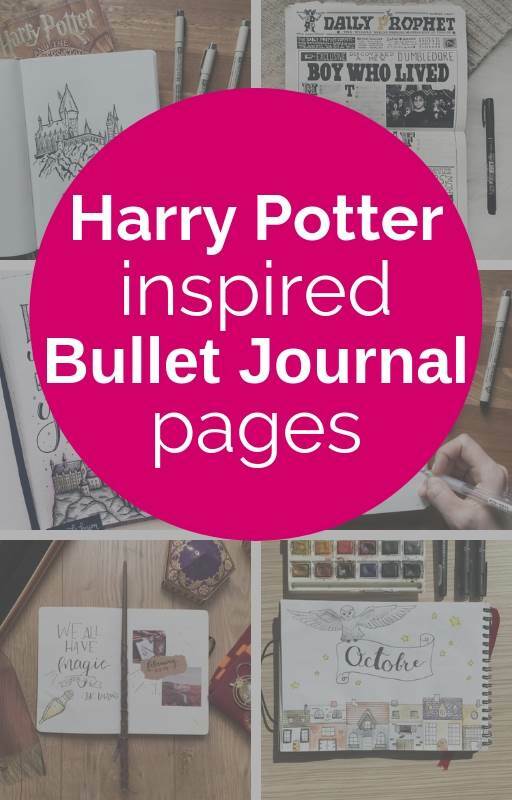 Check out below these cool Harry Potter inspired bullet journal ideas. 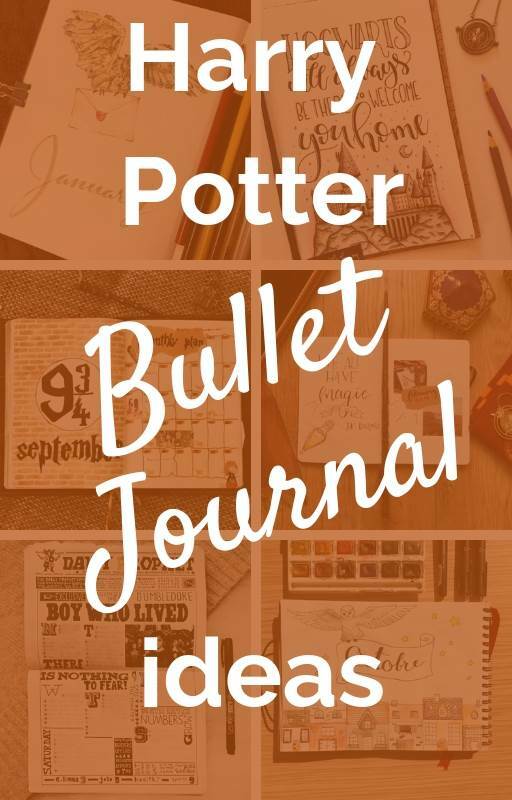 Want a Harry Potter theme for Bullet Journal? 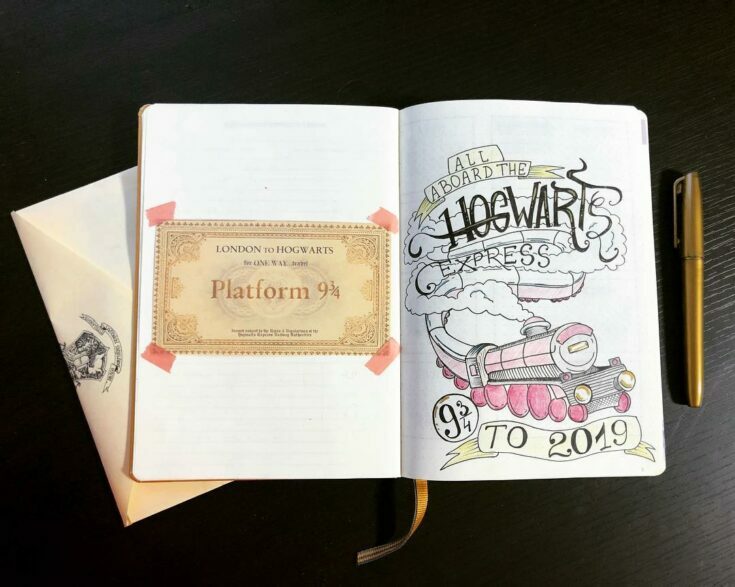 We have collected some of the most amazing Harry Potter Bullet Journal ideas from Instagram. Find Harry Potter cover pages, Hogswart layouts and lots more. 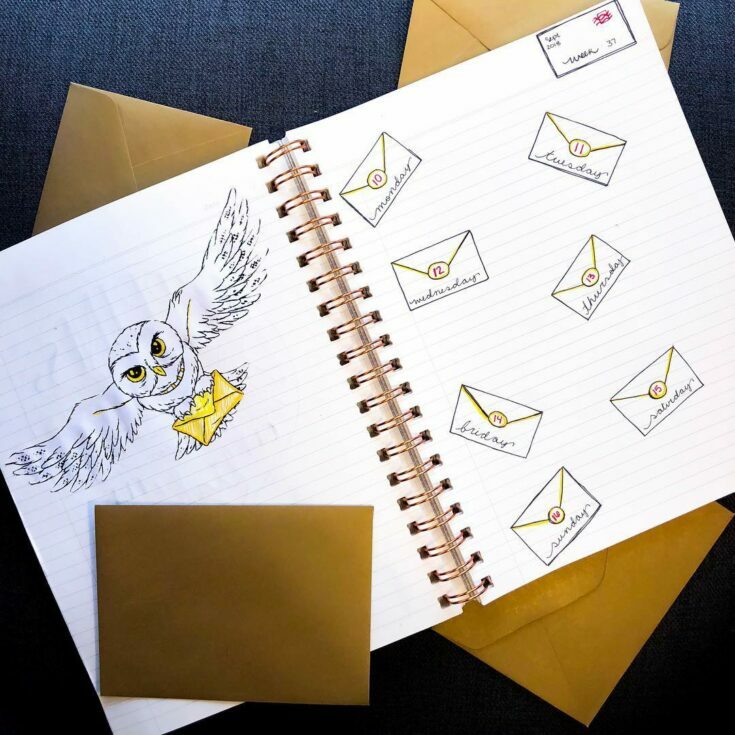 Such a gorgeous way to add some magic to your Bujo and life! Beautiful Hogswarts Quote and font inpsiration for a cover page. 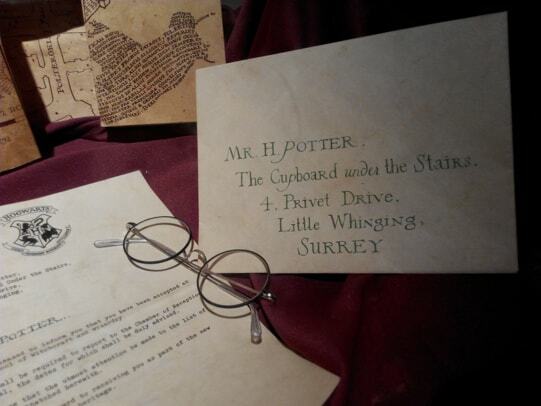 Create a Harry Potter Newspaper layout. 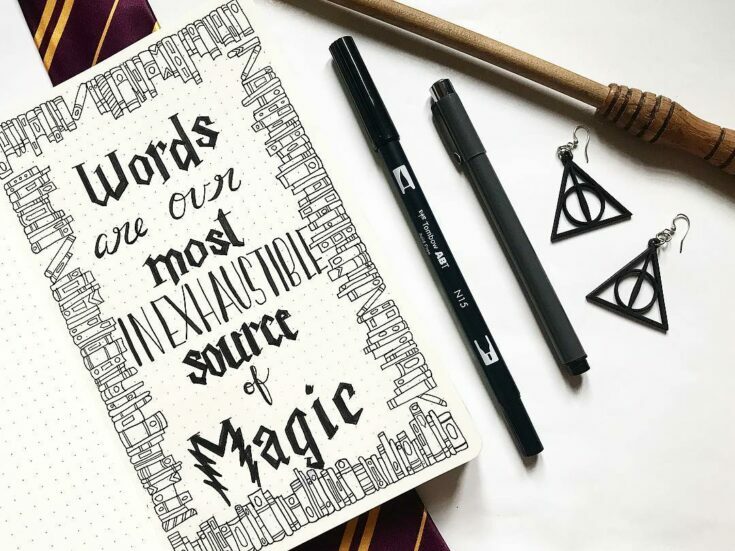 You could add goals, quotes and lots more in this great Harry Potter Spread. 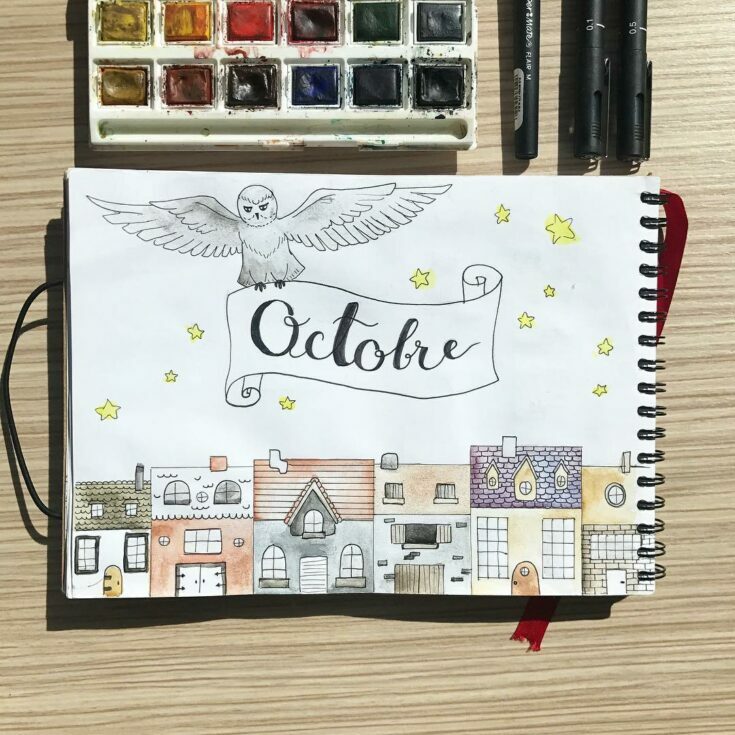 Create a Harry Potter Monthly Cover Page! I love the Harry Potter font used here. How cool is this Harry Potter cover page. You could create this as the start of any Harry Potter themed collection. 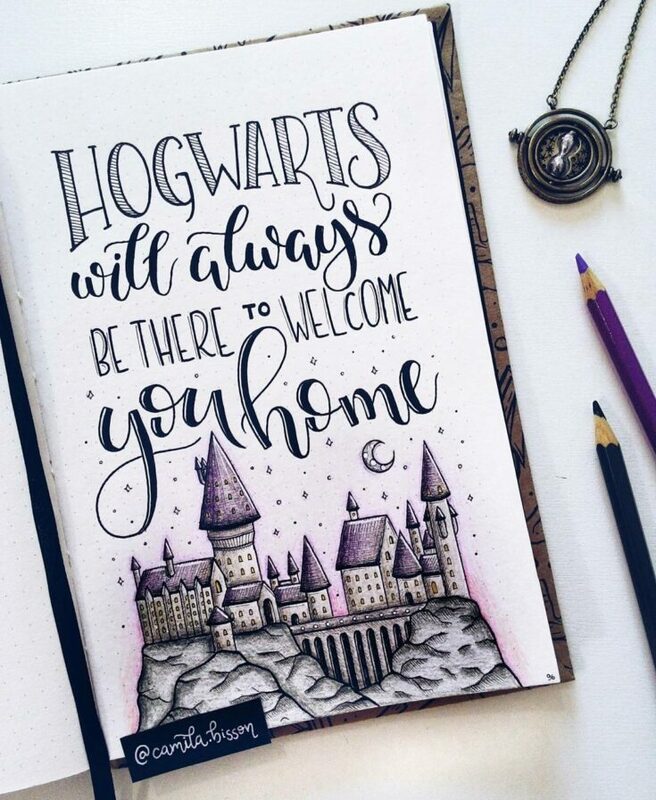 This Harry Potter themed cover page is stunning. I think you could also use this beautiful artwork for decorating a Bullet Journal Address' page. 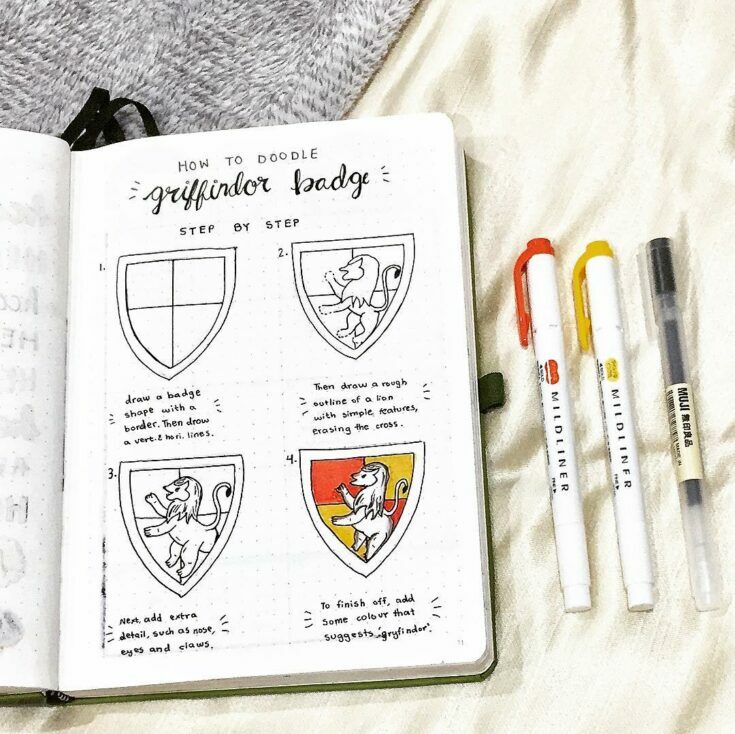 Don't forget to use Harry Potter spells in your Bujo for some added fun! 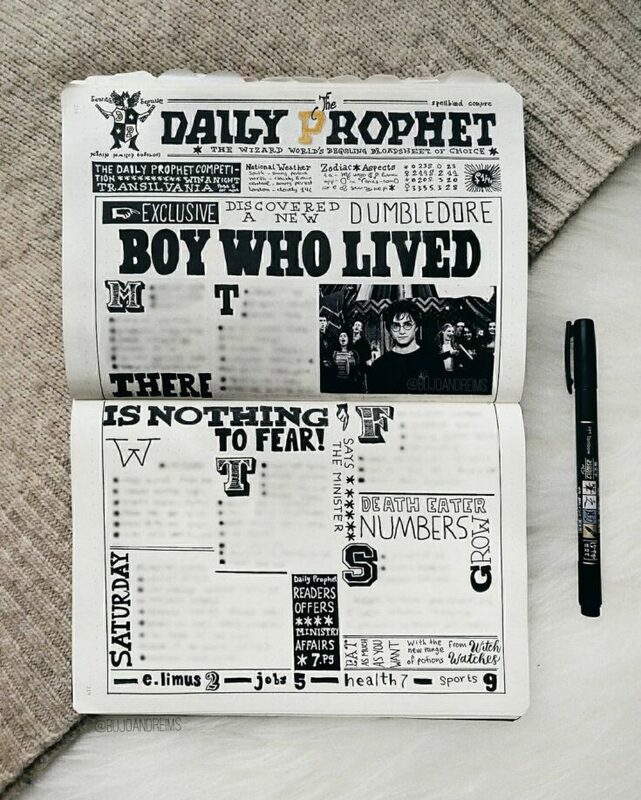 This Harry Potter weekly spread uses Hogswart letters to represent each day. We all know we would love to receive​ one of these in the mail for real! Creating a Harry Potter layout with quidditch is genius. I think you could also use golden snitch balls for the different bullet points too. 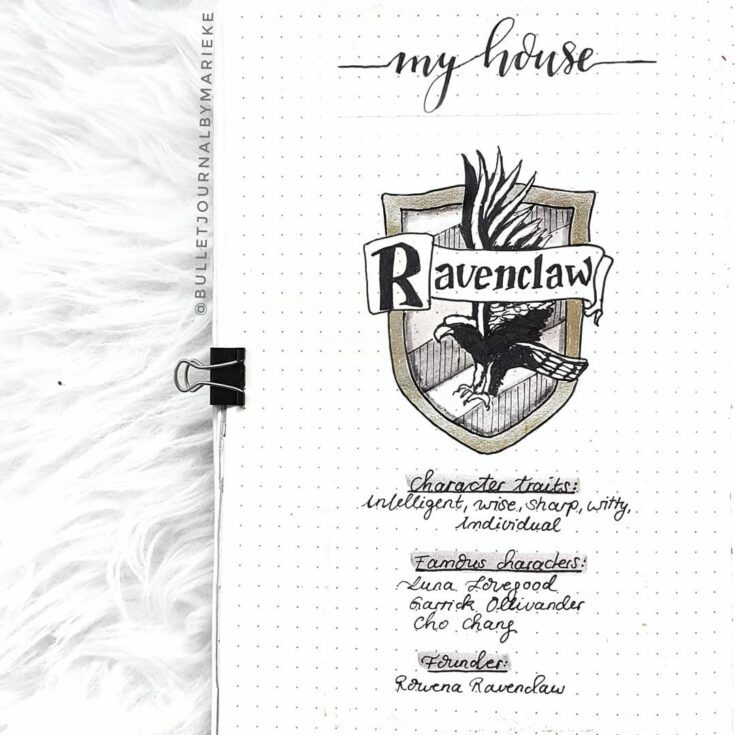 Pick the Hogswart house that represents you the most and make quotes to keeo you motivated and postive in your Bujo. I love this idea of picking an inspirational J K Rowling quote for your Bujo monthly page. She has so many, you will be sure to find one that suits your goals and dreams. 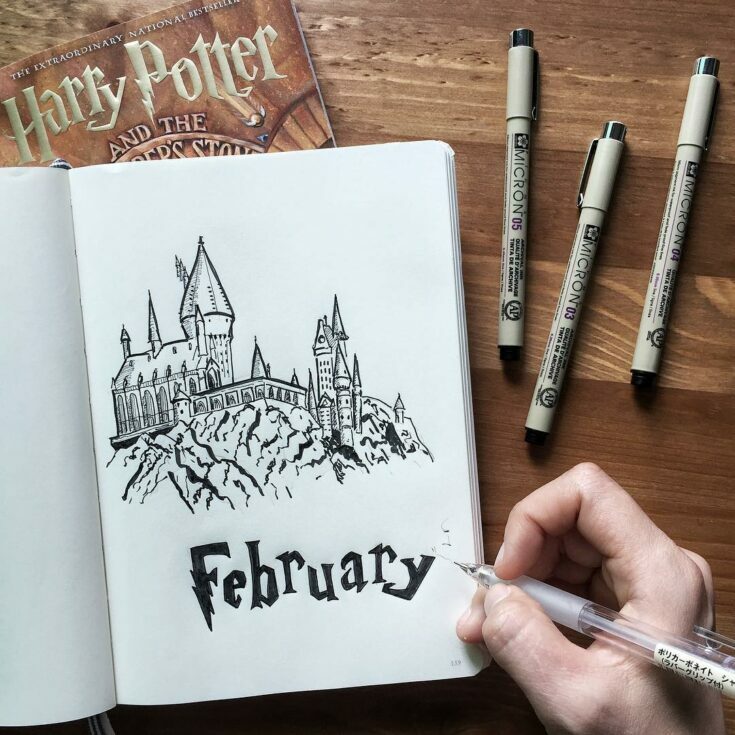 This Harry Potter monthly spread has all your favorite Harry Potter doodles! From Platform 9 3/4 to spells and charaters. 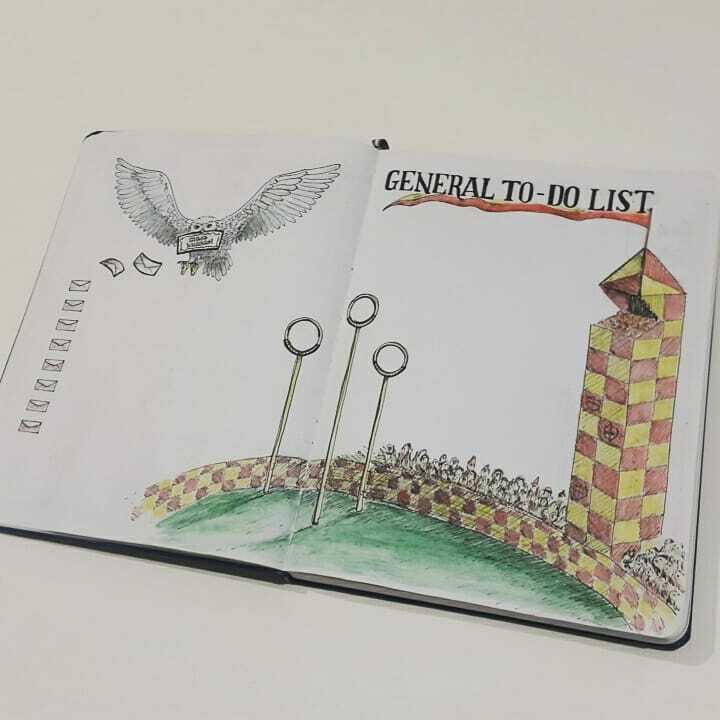 Create a Harry Potter Tracker for your Bullet Journal. 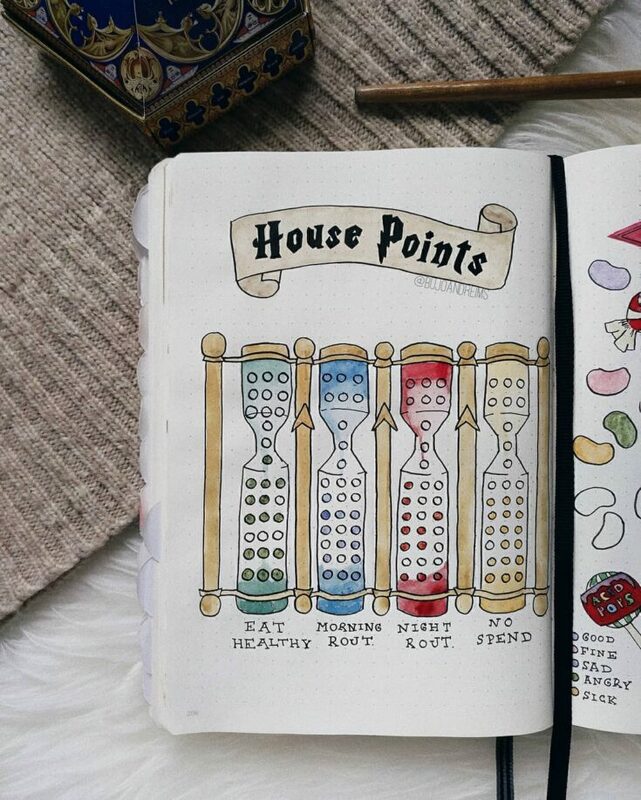 This idea for using House Points is brilliant. You could track your mood or habits! 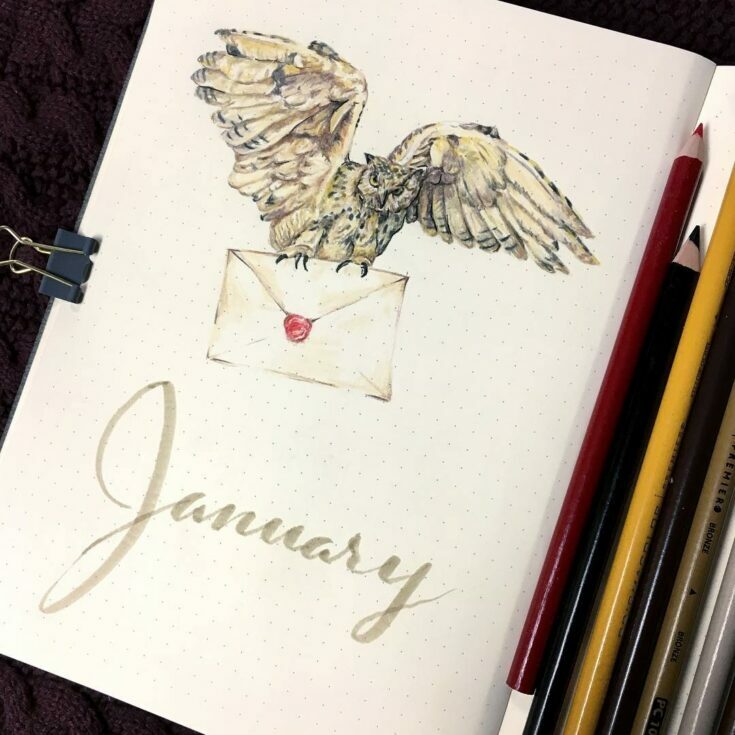 This Harry Potter monthly cover page would add a little magic to any Bujo. How amazing is this Quote page for Bullet Journal? I love the hogswarts library theme. You could also make this a gorgeous Harry Potter 'books to read' spread. 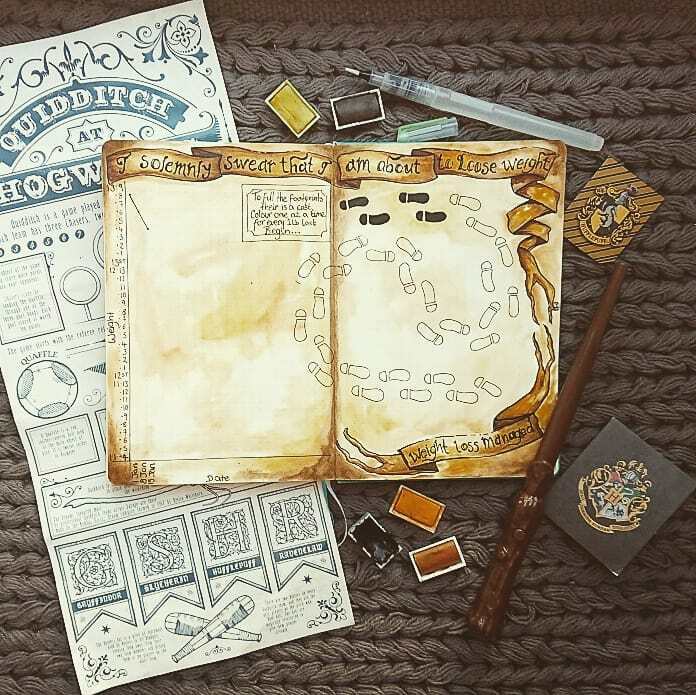 If you want a whole Harry Potter themed Bullet Journal this would make a fantastic HP cover page. I love the ticket idea! 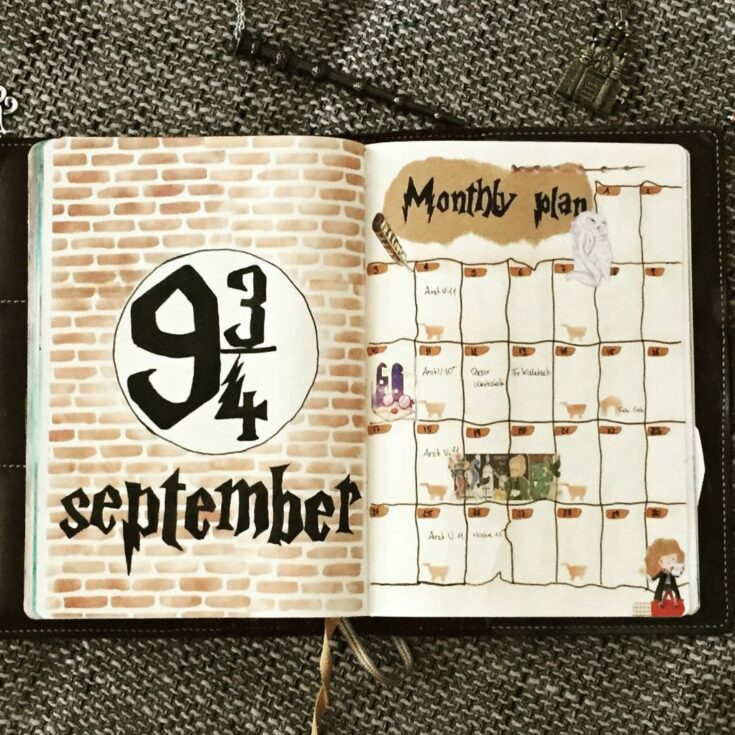 You can't have a HP Bujo theme without a Marauders​ Map spread. This is a clever Harry Potter weight loss layout! 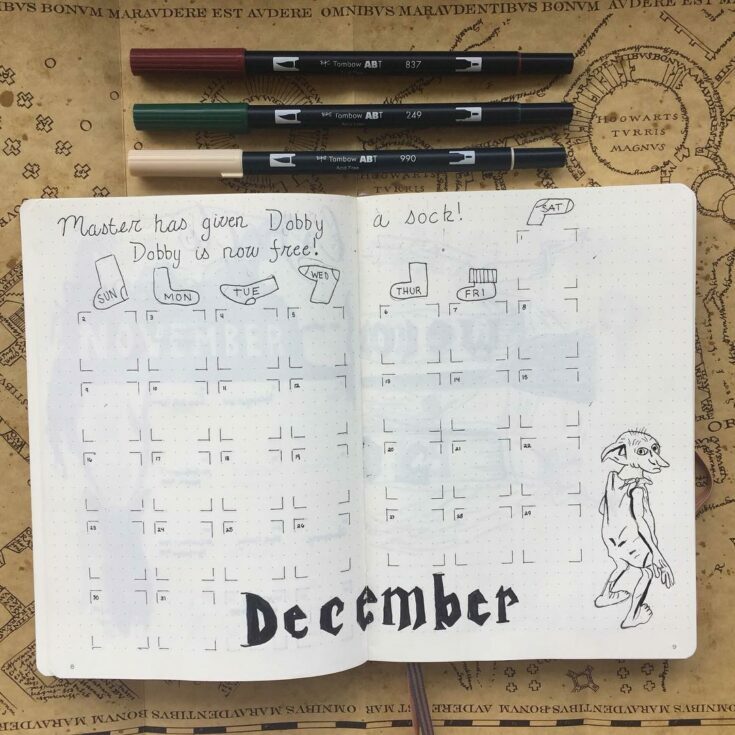 A monthly spread is one of the most useful pages in your Bullet Journal. 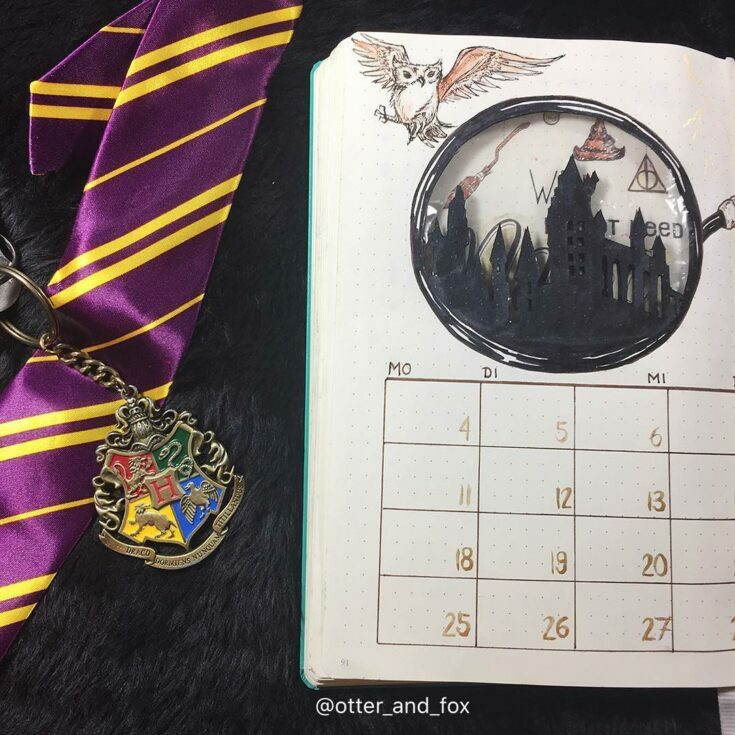 This Harry Potter monthly calendar is just amazing! 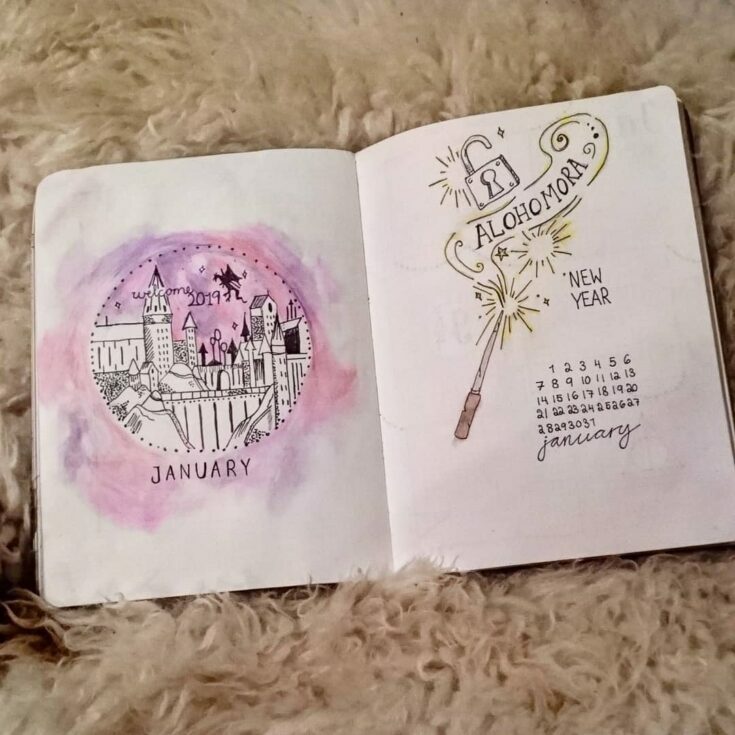 What a way to add magic to your Bujo! 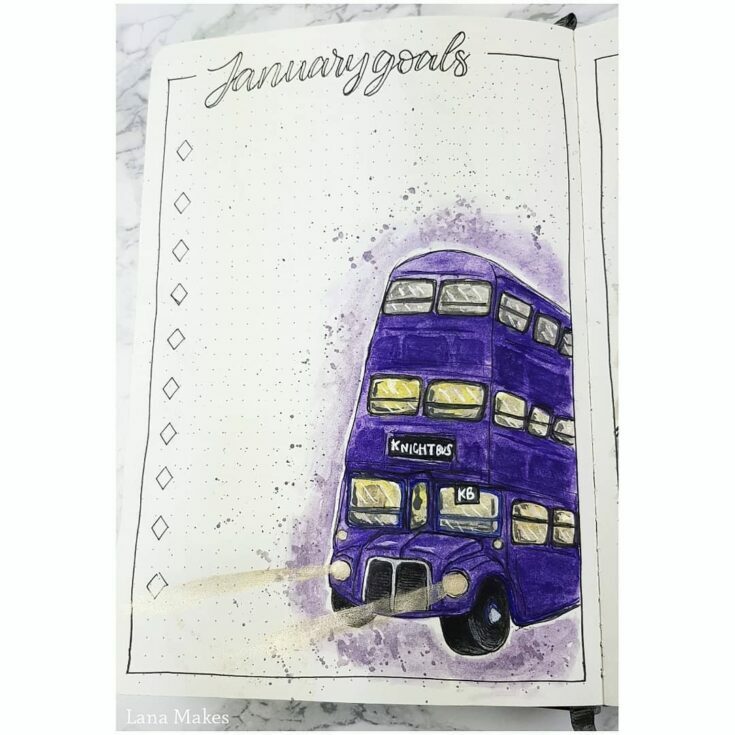 This Knight Bus Bullet Journal spread could be used for so many things. From things to do lists to a travel itinerary.